You'll want it for more than emails, so what's the right choice? Once upon a time the only type of mobile phone you would consider for your business was BlackBerry, but those running on Android and iOS are now hot on its heels. But Android and iOS handsets have come on leaps and bounds and some now exceed the offerings of BlackBerry. If you're looking at iOS then your choice of handsets is pretty slim. You've only really got two options - the iPhone 5 and iPhone 4S - although if you hold on a few months the iPhone 5S/iPhone 6 will make an appearance. The iPhone 4S is slightly cheaper and offers many of the same features as the 5, which in turn has a larger display, beefier processor and slimmer body - but Apple products carry premium price tags. Android, on the other hand, has a vast array of handsets available, including a strong range of budget offerings. High end Android phones include the Samsung Galaxy S4 and HTC One, which easily rival Apple's offerings and won't look out of place in the boardroom. And if you fancy a slightly bigger screen check out the Samsung Galaxy Note 2, or the Galaxy Note 3 later this year. 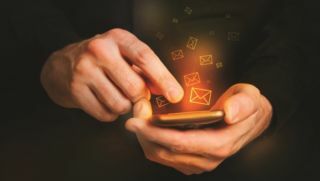 Today's smartphones are more than capable of delivering a decent email experience and both Android and iOS offer fully featured email clients. A little confusingly on Android devices you'll find two clients installed, 'Email' and 'Gmail'. But unless your company uses the Google ecosystem including Google Docs, Drive and Gmail, you're unlikely to require the latter. The Email app allows you to set up multiple accounts and feed them into one inbox, but you can filter by address if things become too congested. Over on iOS there's just the one email client out of the box going by the name 'Mail', and as with Android you can link several accounts into one app with the option to view a unified inbox or filter by account. It's all pretty simple. The days of physical keys on phones seem to have gone, and while BlackBerry is still making handsets such as the Q10 and Q5, the majority of smartphones now on the market are fully touchscreen. This may ring alarm bells for those wedded to their QWERTY keyboards, but the onscreen keyboard needn't be feared, as after spending a little time practising you'll be up to your normal typing speed. On iOS you only get one option - the stock keyboard which Apple installs on every iPhone, iPad and iPod, with no third party solutions allowed. It's a pretty robust offering with good travel between keys, haptic (vibration) feedback if required, and spell check to ensure no embarrassing mistakes; but it's not the best typing experience on a smartphone. By contrast, Android offers a stock keyboard and a huge array of free and paid for alternatives in Google Play. Our personal favourite is SwiftKey, but the joy of Android is that you can download as many as you want, try them all out and find the best one for your writing style. With variable screen sizes on the handsets available you'll find the keyboard experience can range wildly between Android devices. If you're going to be doing a lot of typing we'd recommend getting a handset with at least a 4-inch display. Making sure you can contact the right people at the right time is extremely important, so you want to be able to rely on your phone having the details of everyone you may need at the touch of a button.